BSTOCK: This item has been used for demonstration purposes or refurbished by the manufacturer. JVC Bstock comes with a 1 Year Warranty. 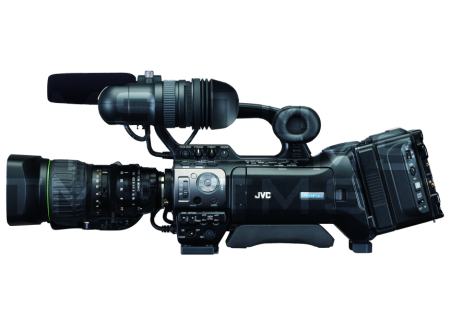 JVC's GY-HM790 is a full resolution HD progressive camera with a modular design providing for complete studio configuration as well as for versatile field use. 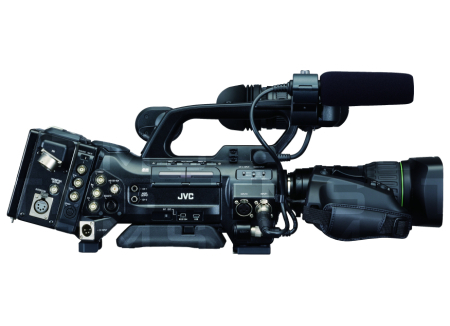 Building on the unique JVC "compact shoulder" form factor, the GY-HM790 offers top picture quality in all HD and SD modes, and is suitable for mainstream studio HD production, EFP, and ENG. ATTENTION: The photos above are stock photos provided by JVC. This item does not include the pictured KA-M790G or Anton Bauer battery. The GY-HM790 is equipped with a 68-pin chassis connector that allows various modules to be attached to the unit without external cabling. The KA-M790 multi-core studio interface module offers a 26-pin interface compatible with cables from JVC and Sony to connect with a camera control unit (CCU.) Power, camera control, intercom, tally and a fully digital HD signal path are available through the RM-HP790 CCU. Other modules include the KA-F790 Remote Fiber Adapter, the KA-AS790 ASI Module, and the KA-MR100G SxS memory card recorder. In a studio configuration, the GY-HM790 can be hand held, or easily fitted with the KA-790 sled, a sleek and functional housing that supports a studio viewfinder, teleprompter and large lens if desired. 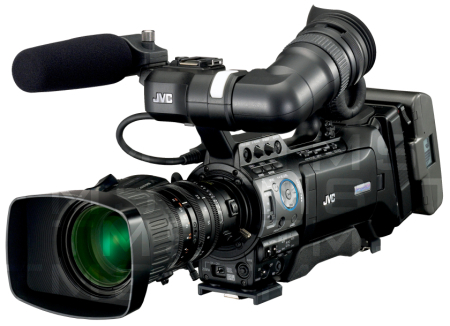 JVC's VF-HP790 is an 8.4-inch high resolution LCD viewfinder with a digital interface to the camera. The GY-HM790 utilizes three precisely aligned 1/3-inch progressive scan full HD CCDsone each for red, green and blue primary colorand outputs full resolution in both 720p and 1080i/p. JVC's advanced ProHD capture technology incorporates a new patent-pending Adaptive Pixel Correlation Technique (APCT), and combined with TRIPLEX Offset Technology delivers exceptional resolving power comparable to cameras with larger image sensors. The highly efficient ProHD form of H-V pixel shift, where the Blue pixels' sensor array is shifted pixel horizontally, while the Red pixels' sensor array is shifted pixel vertically (both referenced to the Green array), enables recovery of additional luminance detail between the photosites of each pixel. By applying the Adaptive Pixel Correlation Technique, the camera achieves a remarkable improvement in image texture and resolving power in the 1080i/p modes. The TRIPLEX/APCT system differentiates between "object directions" in high frequency areas of the image, to the extent vertical, horizontal, diagonal (left) or diagonal (right), and then applies pixel compensation for lost pixels in high frequency areas. Furthermore, using a global shutter, the design minimizes wobbling during quick pans and fixed pattern noise in low light conditions, contributing to a more stable image. 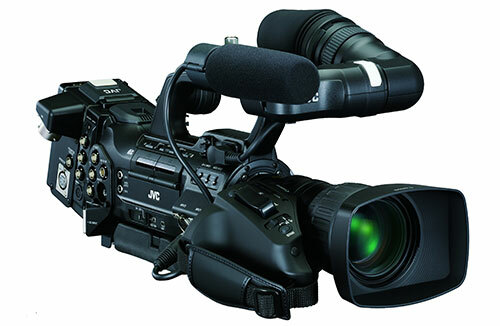 Drawing from its experience in developing rack mount encoders used by major television stations, JVC developed a proprietary codec capable of providing highly efficient compression up to 35 megabits per second, a bitrate that can support full 1920 x 1080 sampling. This results in recorded images of exceptional quality. MPEG2 long GOP is the most widely accepted broadcast standard compression supported by all popular editing systems and broadcast servers. In the HQ mode, the encoder operates with a variable bit rate average of 35Mbps. The SP mode records at a constant bit rate of either 19.7Mbps or 25Mbps to ensure compatibility with a wide range of equipment. Pre Rec (retro cache up to 20 seconds) function prevents "missed shots"